Criminal justice schools in Georgia can train students for the careers that keep Georgia residents safe. According to the Federal Bureau of Investigations, Atlanta has a violent crime and homicide rate lower than most other cities in the U.S. of similar size, and with the median household income in the state set at $49,342 in 2014, many criminal justice professionals can make lucrative salaries. Learn more about the field of criminal justice in Georgia, including which criminal justice schools provide different types of degrees for aspiring legal and protective service professionals. After Criminal Justice School in Georgia: What's Next? 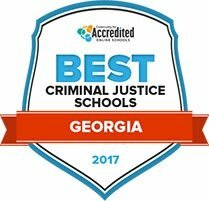 Finding more information on the best criminal justice schools in Georgia is made easy with the following list. Using a wide collection of data, this chart has identified some of the most important factors students look at when selecting a training program, such as tuition rates, student-teacher ratios and graduation rates, and given each a grade. This breakdown provides students a closer look at the criminal justice schools that come out on the top of the list in Georgia. Students at Central Georgia Technical College have the opportunity to enter or advance a career in various criminal justice areas such as justice administration, corrections, and law enforcement and protection services. This program consists of 60 credit hours where students will learn a curriculum based on theory and hands-on application of area-specific skills. Courses cover various topics of criminal justice including ethics and cultural perspectives, legal standards and criminal procedure. In order to qualify for the program, prospective students must be at least 16 years of age and a high school graduate or GED recipient. Students seeking to enter or advance a career in a criminal justice field may consider enrolling in the criminal justice technology program at Augusta Technical College. By blending theory and hands-on application of criminal justice professions, this program should equip students with the necessary skills to succeed in this field. Upon successful program completion, graduates may be eligible to enter various careers in protection, security and correctional fields within criminal justice. For help planning their courses, academic advisors are appointed to criminal justice diploma and degree program participants. Prospective students interested in entering a career in criminal justice can complete their Associate of Science degree in the field at Southern Regional Technical College. This program is designed to enhance students' understanding and ability to perform necessary career requirements for positions in areas of focus such as law enforcement, correctional, justice administration or investigative fields. Students can typically graduate in four semesters after successful completion of the 67 minimum required credit hours. Academic advisors are assigned to students to help formulate their academic path. Criminal justice offerings at South Georgia Technical College can lead to associate degrees, certificates or diplomas. The online DegreeWorks platform allows both students and their advisors track the student's progress toward program completion to anticipate and prevent problems before they arise. Students will also have access to the Life Lab, which includes a range of resources. One of those resources is Student Success Services (SSS), which includes tools designed to help students in all aspects of their academic pursuits. SSS programs include advising, career development, advocacy, special programs and campus involvement. SSS tutors are available to all students. Students in the field of criminal justice can pursue certificates, diplomas and degrees through Ogeechee Technical College. No matter which track they choose, students will learn a combination of theory and practical application. There are courses available for both current working professionals and students seeking entry level positions after graduation. Courses are offered online, at varied times on campus and in the hybrid format to offer maximum flexibility to working students. The college stands out by offering a warrantied guarantee for the diplomas, certificates and degrees they award. All students will undergo an orientation and have the opportunity to meet with faculty. After receiving a bachelor's degree in criminal justice from Albany State University, students will be able to pursue local, state, and federal jobs. Albany State University also offers a master's level degree in criminal justice for students who are looking to further their education in the field. To help students succeed after graduation, the university offers career services to help prepare graduates for life after college and assist in searching for the right job. Students have access to on campus tutoring, as well as academic advisors to help them stay on track with their degree. Students at Mercer University will graduate with a bachelor's degree in criminal justice leadership where they will be able to create a defend opinions about criminal justice, develop and critique crisis situations, and evaluate and apply theories about criminal behavior. For the students who are looking to further their knowledge about criminal justice, Mercer University also offers a master's degree in criminal justice. For those who are looking to get involved on campus, there are organizations ranging from academic, to programming, to multicultural available for students to join. The Student Health Center is also available at Mercer University for all students to use, regardless of insurance coverage. At Armstrong State University, students can earn a bachelor's degree in criminal justice to pursue careers at organizations like the Federal Bureau of Investigation, the Drug Enforcement Agency, or local police departments. Students who want to further their education can also pursue a master's in criminal justice at Armstrong University completely online. Armstrong University also hosts academic, faith based, special interest, and sports clubs and organizations for students to get involved and complement their education. The University Counseling Center offers a place for students to seek help with topics like time management, stress, and relationships. With a bachelor's degree in criminal justice from University of North Georgia, students will be able to develop into leaders of the field. For those who are interested, the university offers a concentration in forensics, as well as a master's degree in criminal justice. University of North Georgia Career Services can help students explore and prepare for career opportunities. Students can also use the school counseling center to get help with issues like, anxiety, depression, and addiction. Other on campus resources include a financial aid office, student health services, and student run clubs and organizations. The criminal justice program at Columbus State University offers students the opportunity to pursue careers at the local, state, and federal levels. The university also offers a graduate degree for those students who are looking to further their studies. Students can get involved in organizations on campus ranging from academic, to recreation, to honor societies. The Center for Career Development is available to help students find the right career and prepare for the job search. Columbus State also provides medical care and counseling to students to enable them to succeed. Free tutoring is also available to all students through the Academic Center for Tutoring. For a larger scale look at criminal justice schools in Georgia, use the following search to explore the various colleges, universities and training programs offered. Students can also find the specializations or study focuses offered within each criminal justice program. Compare and sort schools by different degree levels, financial aid offerings and more. Most jobs associated with criminal justice require some level of higher education, from an academy program to a bachelor's or doctoral degree in criminal justice. For a look at the most popular criminal justice careers in Florida scroll over the tabs below. Click each occupation to show the degree requirements, the median salary for each occupation in Georgia specifically, and how many people are employed each profession across the state. As students explore the different specializations offered by criminal justice schools in Georgia, it can also be helpful to look at job growth and salary projections for common criminal justice careers in the state. Compared to the national average, students who graduate from criminal justice schools in Georgia have more positive prospects when it comes to job growth than most other states across the country. Compare different careers to their national averages in the graphs below, scrolling over the bars to see more details on each occupation. There are many opportunities to work in the criminal justice field in Georgia once school is over. Data below shows opportunities and places where a criminal justice school graduate can apply. These departments are also additional resources for future career openings or to find out what are requirements and benefits for different agencies. A professional group comprised of business related criminal justice professionals specializing in anti-money laundering measures in the Greater Atlanta area. Visit this site for more information on local organization events and members. A group of legal and managerial professionals dedicated to business record-keeping, security and information management. Providing educational programs, networking and outreach programs, the Atlanta ARMA provides events open to both members and their friends and professional colleagues. Georgia's local chapter of the nationally based professional group for in-house business counsel professionals, the GACC is a good source of information for students interested in business compliance and legal matters. From legislative efforts changing business laws and policies in the state to networking, business development and continuing education, the Georgia Chamber provides a place for businesses to come together to stand up for their rights and further economic growth. One of the many programs offered by the Georgia Center for Opportunity, the Prisoner Reentry Initiative is a collaborative effort by experts from non-profit, government, academic and private sectors to provide people returning from prison employment and community reentry opportunities. This site provides details about the mission of the Department of Corrections, and includes a listing of jobs and other positions available in the department. Serving Georgia's youth offenders under the age of 21, employees at the DJJ work to redirect and shape at-risk and incarcerated youth to help them transition into becoming contributing members of society. Learn more about facilities, programs and employment on this site. Learn more about what the Georgia Department of Public Safety does to protect residents and what the benefits of working for the agency are. This agency provides legal representation on behalf of the State of Georgia on pertinent cases with the Supreme Court of the United States. Find more information on the office and employment opportunities here. The Criminal Justice Coordinating Council is a liaison between different criminal justice agencies in the state of Georgia. The agency also prepares policy proposals that are geared to making an impact in the legislative process. The Judicial Council of Georgia adopted licensing and certification training standards in 2015. Find more details on this and Board Appointments here. From training programs for judges and clerks to court reporters and more, the ICJE is a home base for continuing education information for elected court officials, court support personnel and judicial branch volunteers. From court forms and rules to judicial services information, this website provides information on the Georgia Court system, legislative tracking and links to many of Georgia's court-related professional organizations. A professional association for students, criminal justice professors and practitioners, the purpose of the SCJA is to promote and support the field of criminal justice in the southern U.S. The organization also publishes the "American Journal of Criminal Justice". A membership group for paralegals and legal support professionals in Georgia. This site provides information on becoming a paralegal, schools and certification programs, as well as jobs and business partnership listings. From networking to advocacy, mentorship and scholarship programs, the Georgia Association for Women Lawyers has been working to present programs and opportunities for women in law across the state since 1928. The GHBA is made up of Hispanic legal professionals across the state of Georgia, and is dedicated to serving both the Hispanic community and community at large, and specifically supports the recruitment and retention of Hispanic students in law schools and programs. An all-encompassing informational site on law, regulations and criminal justice procedures in the state of Georgia. Learn more about public service opportunities, attorney training and testing, state legal news and the Young Lawyers Division here. A part of the Atlanta legal community since 1961, NALS provides legal education and certification programs as well as networking and leadership opportunities within their membership community. Founded in 1995, the Stonewall Bar Association serves the lesbian, gay, bisexual and transgender community in Georgia. Stonewall offers a student membership program for those interested in providing legal support and fighting discrimination based on sexual or gender orientation. The Greater Atlanta Chapter of ASIS International is a non-profit organization dedicated to the security profession. From a Law Enforcement Appreciation Day to a scholarship program and council dedicated specifically to young security professionals, this membership group provides a wealth of professional development resources. For more information on professionals in law enforcement administration in Georgia visit this site. There are many prep tools available here, from certification information to command college and other training programs, as well as job postings and details on career opportunities. This agency provides information and resources to members of the criminal justice community and others involved in law enforcement in Georgia. This association shares resources for deputies, jail officers and other members of the sheriff's office. Resources include publications, training, and conference information. For more specific details on how to become at State of Georgia peace officer, visit this page for more information on law enforcement and other related criminal justice professional training. A page dedicated to providing information on the law enforcement division of the Georgia Department of Natural Resources. Career and job listing information can be found here, as well as details on Georgia's boating, fishing and hunting regulations. A division of the Georgia Department of Natural Resources, the EPD uses enforcement actions to combat environmental problems and help businesses, government entities and individuals meet environmental compliance laws. From information on conservation to forest management, planning and reforestation initiatives, the Georgia Forestry Commission also provides forest law enforcement information and career opportunities on this site. The resource for public land management in the southeastern U.S., the BLM regulates mining and energy exploration and development on Federal land. For details on Georgia and other southeastern states, including fire protection plans and how to get involved with land-based services, visit this site. Dean Dabney is an Associate Professor in the Department of Criminal Justice and Criminology at Georgia State University. His scholarly interests include the organizational culture within law enforcement agencies, forms of deviance and/or criminal behaviors that occur in organizational settings, and qualitative research methods. He has published 4 books, including the recently released Speaking Truth to Power: Confidential Informants and Police Investigations and several dozen articles appearing in such outlets as British Journal of Criminology, Criminal Justice & Behavior, Punishment & Society and Justice Quarterly. What skills do students gain in a criminal justice degree program in Georgia? AThe substantive emphasis of criminal justice programs varies somewhat across schools. For instance, some emphasize a more applied approach, while others are more liberal arts focused. Generally speaking, research universities exemplify the latter while two- and four-year schools the former. Regardless, they will tend to provide substantive content in police, courts, corrections and crime. This provides basic background understanding for folks entering the criminal justice system as a practitioner or prepares them for law or graduate studies. How can these programs prepare students to superficially work in Georgia's criminal justice field? AThe substantive coverage of police, courts, corrections and crime provides background understanding on how their practitioner oriented job will work. Perhaps more importantly, a liberal arts emphasis will prepare them as better communicators (written and verbal) and help them understand cultural differences that are central to the job. Some students may be interested in a criminal justice career because they are fans of shows like "CSI" and "Criminal Minds." What would you tell those prospective students about the realities of the criminal justice field? AMost undergraduate criminal justice programs are generalist in nature and do not prepare them for these specific jobs. They should seek out a program specifically designed to provide forensic science content and/or plan to attend graduate school in a hard science area. If there are Georgia students who are not sure whether criminal justice is the right degree for them, what would you tell them? AThey should contact the undergraduate coordinator or academic assistance professional at prospective schools to get a sense of the substantive emphasis of the program and sorts of job placements that they yield.